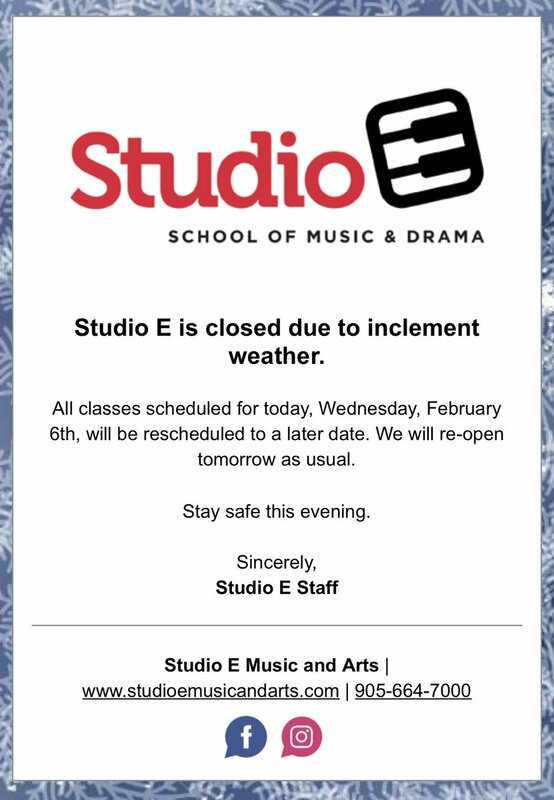 Studio E will be closing early today at 12:00pm due to inclement weather. All group classes including Sewing, Theory and DiscoverE ECE will be cancelled. We will contact everyone throughout the week to book make-up sessions. Here is this month’s Newsletter for May! Studio E will be closed on Monday, May 21st for Victoria Day. Stay safe around fire works and enjoy the long weekend! 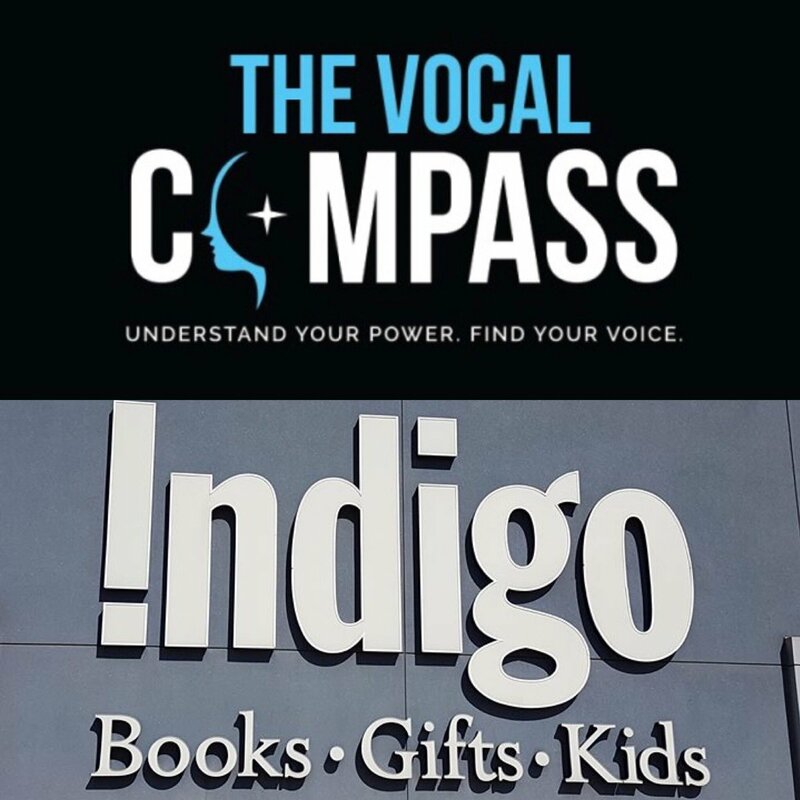 Teaching for over 20 years throughout North America has lead Studio E Owner/director, Teresa Cirillo, to develop her own vocal technique…The Vocal Compass™. We welcome all Studio E Families to come out to the book release party on Thursday June 7th at 7:00pm. Stay tuned for more details. You can purchase a copy of the book at the front desk for $22.95 + HST! As of this month, all clients will receive an automatically generated invoice on the 1st of each month via email. If you have a pre-authorized payment on file, a receipt will also be emailed to you when your payment is processed. If you did not receive an invoice on May 1st, please let us know so we can update your email in our system. Registration is now open! Please see the list of days and times below. Days and times are on a first come, first serve basis. INTERESTED IN ADVERTISING YOUR BUSINESS? We are looking to fill the following ad spaces in our program! If you need us to help put something together, send us a logo and your preferred message and we can help design your advertisement at an additional cost of $15.00 + HST. Your ad will be featured in all 7 of our Studio E recital shows, and is a great way to circulate your business to over 500 Studio E families! Please speak to one of our receptionists for more information! ARE YOUR LESSONS ON FRIDAY’S OR SATURDAYS? All lessons scheduled during recital weekend – Friday, June 8th and Saturday, June 9th – will be rescheduled throughout the month of May. Please speak with a receptionist to arrange a make-up lesson at your earliest convenience. Registration is now open for our May Open Mic Night! This is your chance to practice what you’ve learned and perform in front of your family, friends and peers! Register today! Only a few spots are available. More information is available at the front desk! As part of a new addition to our website’s blog, we are adding a feature segment every month called Staff Spotlight. Each month we will feature one of our instructors, with some get to know information so our families can learn more about the instructor their child has lessons with, or an opportunity to learn more about the incredible staff we have at Studio E. You can follow along with our new feature by checking out the Blog on our website HERE. Our camps last year were a huge success so we will be continuing with a very similar format. The days will be split up into sections for music, art and acting specific to the musical/theme of the week. 9am-4pm Monday-Friday. Before and after care also available. 7 weeks! 7 different musicals! Visit the front desk or CLICK HERE for info! Video audition submissions and registration for the live, in-person auditions with the judges are now open! Must be 16 years old by September 1st. CLICK HERE for more info and to apply! With her first book, “The Vocal Compass”, set to release, Owner and Director Teresa Cirillo will also be taking part in a panel discussion at the Canadian Music Week Music Summit called “Holy Holistics: A Health and Wellness Approach to Performance and Creativity”. 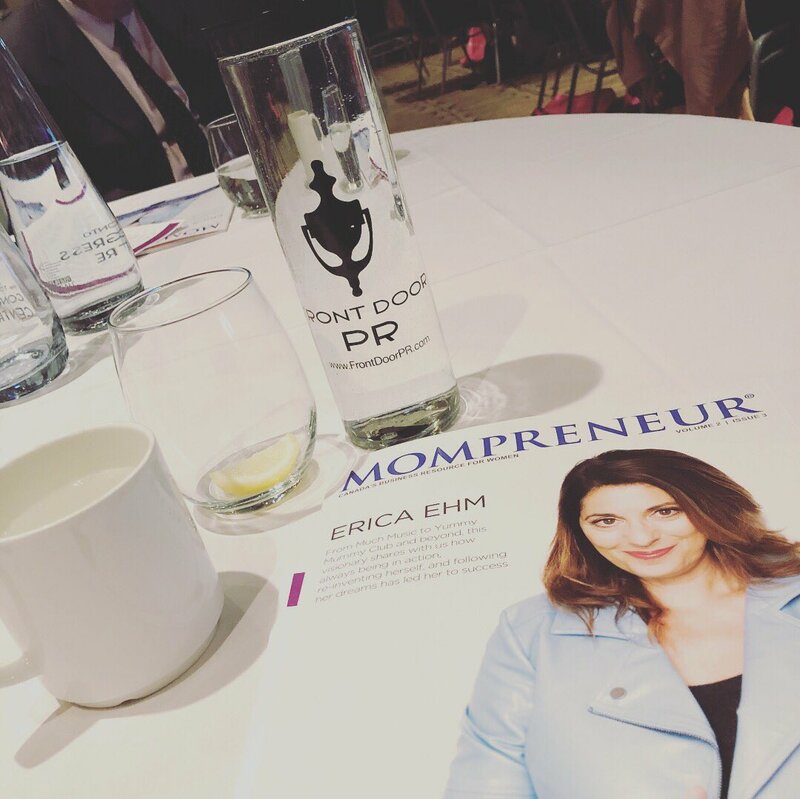 Join her May 10th at 11am at the Sheraton Center in Toronto! CLICK HERE to read more about the panel! For our full Newsletter, click here! To subscribe to our Monthly Newsletters, Click Here. As part of a new addition to our website’s blog, we are adding a feature segment every month called Staff Spotlight. Each month we will feature one of our instructors, with some get to know information so our Studio E families can learn more about the instructor their child has lessons with, or an opportunity to learn more about the incredible staff we have at Studio E.
This month’s featured staff spotlight is: Robin! From humming as a baby to receiving awards as a young performer, music has been a driving force in Robin’s life. 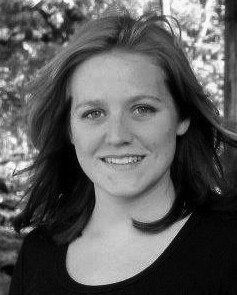 Robin has been pursuing a career in music for over half of her life. She started teaching music in a high school co-op class, and continued to expand her skills in college with the ‘Teaching Methods’ class. She currently teaches pop, opera, jazz, rock, classical, RCM and musical theatre in voice, all genres of flute, all methods of piano, and Theory. She has been teaching professionally since 2009. In her free time, she studies guitar and song writing. Robin and her students work hard together to reach their goals. Robin loves sharing all the wonderful things about music through her teaching. Each student, no matter the age, has a special place in her heart. Here is our question series with Robin! Q: When did you decide to pursue music as a career? Robin: I didn’t decide to pursue music. It has always been music or nothing for as long as I can remember! Q: Who is your favorite solo musician or artist? Q: What is your favorite hobby outside of music? Robin: …wait what? Is that even a thing?! Just kidding. I have lots of hobbies, but my top 3 would have to be coloring, Anime/Manga, and Harry Potter…have I shown you my wand yet?! Q: What is one tip you have for your students that helps them practise even when they are dreading it? Robin: Nobody likes practicing (I have those days too), but it makes a difference and helps us grow. Q: What is one instrument you would like to learn that you do not already know how to play? Robin: Alto Saxophone or Violin! Here is this month’s Newsletter for April! For the convenience of our clients, we will now be accepting pre-authorized debit payments (PADs) as of March 1st. We will continue to accept cash, cheque, debit or credit at the front desk as well as pre-authorized credit card payments. Since music can be so beneficial to children during their early childhood years, we at Studio E want to provide a program that promotes exploration and musical discovery. The program will run from 9:30am-12:00pm and 12:30-3:00pm on weekdays with healthy snacks and drinks provided. Stayed tuned for information regarding our upcoming open house! Registration is now open for our April Open Mic Night! This is your chance to practice what you’ve learned and perform in front of your family, friends and peers! Amazing speakers at Canada’s first MAJOR songwriters weekend, great opportunity for singers and songwriters! Speakers include: Acclaimed songwriter Brian Packham, Licensing and publishing specialist Jennifer Beavis, Singer-songwriter Luke McMaster and Studio E’s Owner and Director Teresa Cirillo!! Weekend also includes a Friday night networking and meet-and-greet concert and a Saturday night Open Mic! Must be 16 years old by September 1st to apply. CLICK HERE for more info and to apply! With her first book, “The Vocal Compass”, set to release, Owner and Director Teresa Cirillo will also be taking part in a panel discussion at the Canadian Music Week Music Summit called “Holy Holistics: A Health and Wellness Approach to Performance and Creativity”. This months featured staff spotlight is: JESSICA! Jessica is our DiscoverE ECE and Rockband Instructor. She teaches children between 0 to 7 years of age through an interactive and fun introduction of music that helps with their development in a variety of areas. In teaching rhythm, music and movement, she helps them learn to sing songs with instruments and uses dynamics, tempo and emotion to enhance learning, literacy and motor skills! They also get an opportunity of alternating between several instruments and disciplines such as guitar, drums, percussion instruments, piano, and voice. 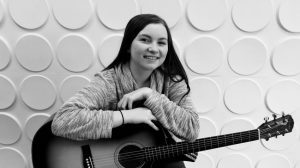 As an ECE she is excited to combine her love of music and passion for education in order to aid students while they explore the world of music! Here is our question series with Jessica! Jessica: My dad always played guitar for me as a baby, my parents say I was humming and singing before I learned how to talk! What is the first instrument you decided to try to learn? Jessica: I started singing when I was 6 and started having an interest in guitar around the same time. What is something you have been meaning to try out (food, hobby, etc) that you haven’t gotten around to? Jessica: I’ve always wanted to get more into cooking. What is one interesting fact about you that most people may not know seeing you as a music teacher? Jessica: I don’t have many facts my students wouldn’t know, but, I eat A LOT of food. When I’m not teaching, I’m eating. I always have snacks. What is an artist/genre that you like that your students may not expect that you would like? What is one thing about teaching that makes it enjoyable to you? Jessica: As much as I love teaching, I also love that every day the children teach me something new! It’s amazing how much you can learn when you work together in the class room. 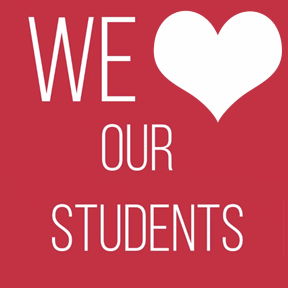 Wear red to your lessons all week long and help us spread some Studio E love! September Registration is NOW OPEN! 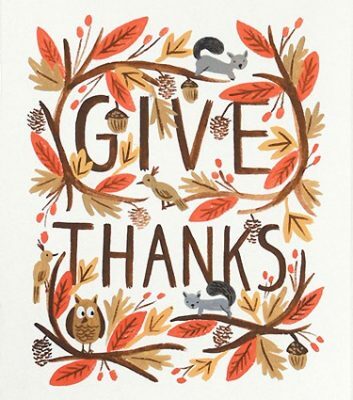 Give us a call, shoot us an email or drop by the studio to secure your fall time slots. Private lessons and specialized group programs available for registration. New & returning students are welcome! Spaces are limited & will be reserved on a first come, first serve basis. Don’t miss out on finding your perfect time slot! Register for your preferred recital date & time with one of our receptionists! Wear your Christmas attire to your lessons from Monday, December 12th-Saturday, December 17th and get your name entered in our Christmas Draw! We will also be serving delicious hot chocolate … mmmm!